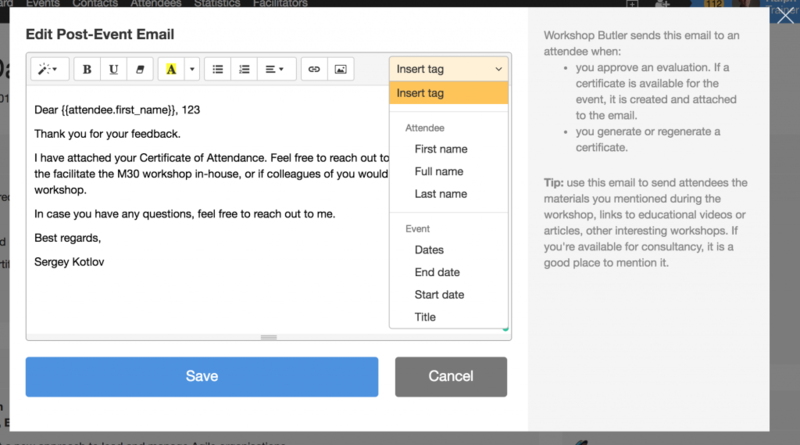 Big update for different types of emails that you or Workshop Butler send to attendees. We completely redesigned the email editor. Now all emails use the same editor, which makes the process of editing more natural (comparing to a previous one). We reworked email tags and added several new ones (like the dates of an event). You can also find a detailed description when the system sends emails of this type. We are working on a new version of website integrations, much more customisable, available in several languages, and very easy to use. Several of our clients already use it in production, but we are not ready to make it public yet. However, we published a documentation. If you want to take a look and provide your feedback, use this link. We appreciate it a lot! The Export button on the list of event evaluations didn’t work. It’s fixed now.